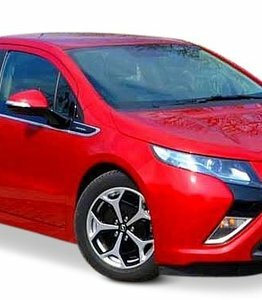 Windscreen replacement for an Opel Ampera or Vauxhall Ampera? The windscreen replacement of an Opel Ampera can be quite expensive. If you are in possession of this plug-in hybrid and have damage to the windscreen then it is important to solve this quickly. Although this model has been replaced by its successor, the Opel Ampera-E, it is still a popular vehicle. The production of the Opel Ampera ran from 2011 to 2015 and therefore it is certainly worth to replace the Opel Ampera windscreen. The car can last for many years if the maintenance remains good and broken parts are replaced in an adequate manner. Fortunately, there is an inexpensive way for the windscreen replacement of the Opel Ampera. By ordering an after market windscreen from us you save a lot of money. Before going into the cheapest way to replace a window, we will first discuss the history and some details of the Opel Ampera. Of course, the name of the Opel Ampera is derived from the unit of electric current, the ampere. This unit is so called because of the inventor of electromagnetism, the Frenchman André-Marie Ampère. Of course, this is a very appropriate name for a car that gets its drive partly from an electric motor. Funny detail is that the Opel Ampera is a rebatched version of the Chevrolet Volt. This name of course comes from Alessandro Volta and the unit of volts named after him, which is used to represent electrical potential and voltage. One comment on these electrical references to the car is that Opel initially marketed the Ampera as a fully electric car with a so-called 'range extender'. If you take a critical look at this, you will notice, however, that the car has a range of up to 60 kilometres, using only electricity. Anyone who wants to cover a longer distance than this must choose to wait until the car is recharged or continue driving on the internal combustion engine. This combustion engine is also called the range extender. In practice, this range extender is a 1.4-litre combustion engine that can deliver a maximum output of 63 kW. The internal combustion engine generates current for the car's drive via a dynamo. The lithium-ion battery with a maximum delivery of 16kWh can be partially charged by the internal combustion engine so that the car effectively always has an electric drive. The maximum distance the Opel Ampera can travel without consuming petrol or without having to park the car at the charging station makes it an ideal vehicle for commuter traffic and short trips. As a holiday car, the Opel Ampera has not really gained a foothold due to its limited range. As you are well aware, General Motors, the American car company founded in 1908, has been the owner of the Opel brand for many years. After the establishment of Opel's car branch around 1899, it only took a few decades before it came into the hands of General Motors. In 1929, General Motors acquired 80% of the shares of the Opel family, followed in 1931 by the last 20%. An interesting fact is that General Motors was unable to control the car brand during the Second World War. In Nazi Germany, the company temporarily became state property. From 1940 to 1948, General Motors was therefore not the official owner of the mark. It was only in 2017 that the brand was sold and nowadays it is in the hands of the PeugeotCitroën group. The Chevrolet car brand also has a long history and, like Opel, has played a central role in the development of General Motors. The founder of General Motors, William Durant, had made substantial debts to his company through many takeovers. So, together with Louis Chevrolet, he started a new car brand that became so successful that he was able to regain his position with General Motors. Chevrolet has therefore been part of the now giant group since the early days. The Opel Ampera was also a similar vehicle. In many countries the model is known as the Chevrolet Volt. A windscreen replacement of an Opel Ampera is therefore also possible with a Chevrolet window. However, these cars never came onto the market in Europe, so they hardly ever drive around here. Replacing the windscreen of an Opel Ampera can, of course, be done by a brand dealer. The problem is that the costs here are often very high. This is in particular because, in the first instance, brand dealers have an exclusive right to sell windows with a brand logo. As a result, they can make the price higher than necessary. This is not the case with after market automotive glass. With us you can therefore replace a windscreen from the Opel Ampera for a fraction of the amount. Moreover, the quality is exactly the same. The windows come from the same factory and must meet the same high quality standards. It does not matter, therefore, what version of this car you have. In addition, we also sell suitable products for other models of the brand. You can also count on us for a windscreen replacement of an Opel Astra, Corsa or for example the new Adam. You can of course install the windscreen you buy from us yourself, but it is also possible to have this done on location by our certified partners. Of course, having a windscreen installed that you bought from us is many times cheaper than outsourcing the job to a brand dealer. Choose the cheapest option and order a new windscreen for your Opel Ampera today.